A sense of agency and urgency is at the pivot of 'dementia rights'. This week, the first two ever Dementia Rights Champions will give their first information sessions in the innovative ‘Dementia Rights’ programme. Dementia Rights is a novel, innovative programme designed not just to dispel the stigma and prejudice which can surround dementia, but also is supposed to be of practical help to people living with dementia in the UK to help ‘unlock’ their rights. Dementia Rights information sessions are about 45-minutes to 60 minutes, and are designed to spread five key messages the Dementia Society thinks everyone should know about rights. These are shown on their pledge card. There are currently about 900,000 people in the UK who’ve received a diagnosis of dementia. All of them are defined by their unique identities as persons, not defined by the labels of the dementia diagnosis. The Dementia Friends programme from the Alzheimer’s Society and Public Health England was a social movement launched in 2012 as part of the Prime Minister Dementia Challenge to help to raise awareness of dementia. One of the key messages in Dementia Friends is that it is possible to live well with dementia. 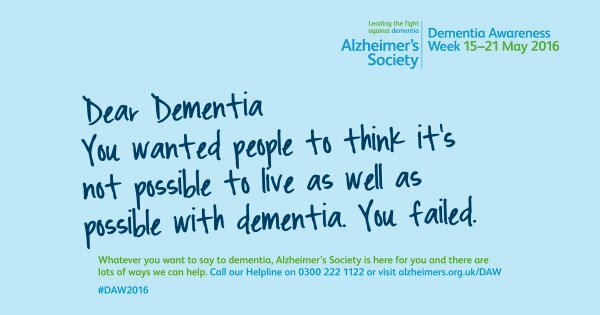 For ‘Dementia Awareness Week’, the Alzheimer’s Society is asking everyone to confront dementia. Their research yet further shows that people are on the whole reluctant to seek a diagnosis. This is possibly due in part to the negative social perception of dementia. I presented a talk earlier this year in Budapest at the 31st Alzheimer’s Disease International Conference. This talk presented novel survey data on how knowledge of legal rights from domestic and international instruments was generally poor. This lack of knowledge about rights is a major barrier to the widespread adoption of rights internationally, it is felt. The international stakeholder group of people with dementia “Dementia Alliance International” have led on this rights based initiative to promote rights. As part of campaign, they have been globally concerned with making sure that people know that they can ‘make a difference’. This sense of agency and urgency is pivotal to make rights for dementia a reality. You can support their brilliant work directly here. There is a growing feeling that rights based advocacy in dementia is not at all about people making money ‘out of opportunities’, and death by powerpoint or commissioning. I have written a pamphlet on the application of rights in England and Wales jurisdiction, which contains general principles of use in other jurisdictions. I am making this work available for free, but this is no replacement for actual legal advice; the pamphlet is clearly meant to be a general introduction to the area. You can help this Dementia Rights movement, by contacting me if you want to become a Dementia Rights Champion. I’d love to hear from you. “Dementia Rights” is a social action movement that aims to increase understanding of the importance of rights and dementia and inspire people to take action to promote these rights in the community. To become a Dementia Rights Supporter, all you need to do is learn five key messages that we think everyone should know about dementia and rights in any country, and then commit to take an action which promotes rights in dementia. 1. Rights apply to everyone, and ought not to be taken away. The 1948 Universal Declaration on Human Rights is by far the most widely accepted definition of human rights, encompassing civil and political as well as economic, social and cultural rights. Human rights are relevant to all of us, not just those who face repression or mistreatment. They protect you in many areas of your day-to-day life. So – in summary, key qualities of human rights have been agreed upon by the international community. Rights can never be taken away, although they can sometimes be restricted – for example if a person breaks the law, or in the interests of national security. Indivisible and interdependent: governments should not be able to pick and choose which are respected. Rights go together with responsibilities. 2. With rights go together with responsibilities expected of individuals. With rights come responsibilities expected of individuals. “Qualified rights” are rights which require a balance between the rights of the individual and the needs of the wider community or state interest. These inclue: the right to respect for private and family life, the right to manifest one’s religion or beliefs, or freedom of expression. 3. Dementia is in law a disability. A mental health condition is considered a disability if it has a long-term effect on your normal day-to-day activity. There are many different types of mental health condition which can lead to a disability, including dementia. Dementia is one of the major causes of disability and dependency among older people worldwide. Under article 9 of an international instrument called the UN Convention of Rights for People with Disabilities, all people with disabilities have the right to access all aspects of society on an equal basis with others including the physical environment, transportation, information and communications, and other facilities and services provided to the public. 4. It is possible to enforce legal rights. Rights can be used in real life locally and have some “teeth”. Legal provisions in equality and human rights are enforceable in a number of countries, either directly or indirectly. 5. A major function of human rights is protect against discrimination. Disability comes under this as a ‘protected characteristic’, and dementia is a disability. People are not allowed to discriminate because they have any of the protected characteristics. There is also protection against discrimination where someone is perceived to have one of the protected characteristics or where they are associated with someone who has a protected characteristic. Discrimination means treating one person worse than another because of a protected characteristic (known as direct discrimination) or putting in place a rule or policy or way of doing things that has a worse impact on someone with a protected characteristic than someone without one, when this cannot be objectively justified (known as indirect discrimination). Please use the form below if you would like to be considered to join Andy Tysoe and Cathrina Moore as the first “Dementia Rights Champions”. You will need to be able to deliver Dementia Rights information sessions, according to comprehensive guidance. 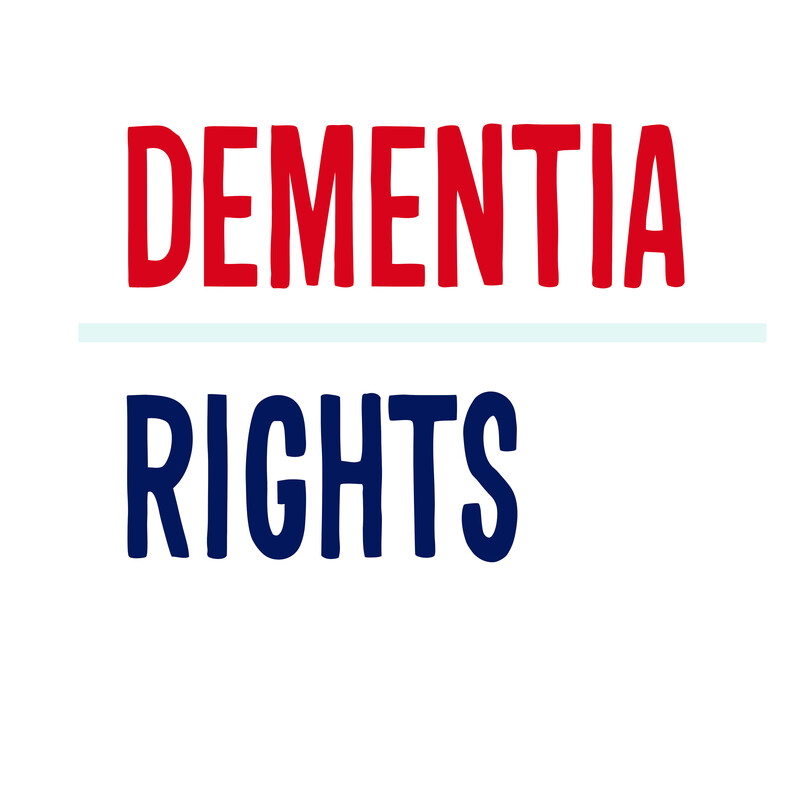 Rights are pervasive in all aspects of dementia life, for example in the right to dignity (to be in clean hospital clothes through an inpatient stay) or a right to a fair trial (to make a complaint against a care home if need be). Dementia Rights involves public information sessions, lasting about 40-60 minutes, containing fun activities promoting a rights-based approach to dementia. To organise your own volunteering in times and places that fit your availability. To promote Dementia Rights throughout your own networks and communities. To act as an ambassador for Dementia Rights, treating everyone with respect and dignity. Dementia Rights is on Twitter, @DementiaRights. What would you say to Dementia? I have no trouble in pretending that cats are human beings. I conceptually do not think of ‘dementia’ as a person, but I concede a common image is for dementia to be portrayed as an ‘unwanted travelling companion’, often converting a husband and wife relationship into a ménage-a-trois. 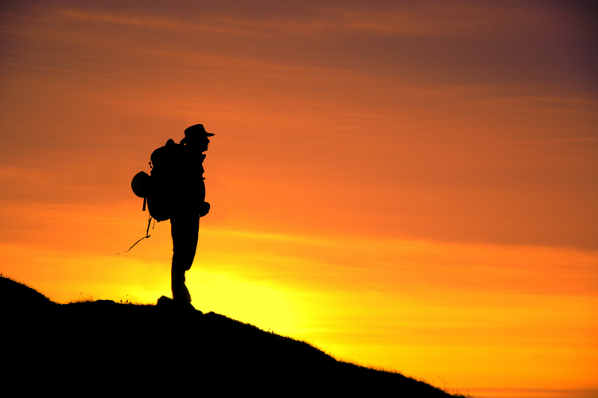 The metaphor is usually pushed to an extreme as one being on a ‘journey’ with dementia. When indeed I mentioned this to a particular celebrity campaigner living with dementia, he said ‘it’s the only journey you make where the ticket is definitely one-way and you don’t want to look after the ticket’. As for this particular ‘journey’, we don’t currently have a national sense of care pathways. An advantage of care pathways according to the current literature would be to specify a set of basic needs for decision points from the point of diagnosis (even before) to death (and even beyond), which was sufficiently flexible to factor in inevitabilities such as local cuts to services. But say you are talking to this mythical person with dementia. It is possible that the media have whipped you up into a state of anger and frustration into an emotion of ‘What do we need to do to make you go away?” This would be to embrace full-on the metaphor of warfare and battle. The problem with this approach is that you rarely hear of people ‘winning the war against dementia’. And it has never been adequately explained what the end point of ‘defeating dementia’ is. For the 48 million people living with dementia around the planet, it might not be necessarily that drug cure that ‘stops dementia in its tracks’. There has already been some expectation management in that even if a drug were found to treat dementia ahead of schedule it might be too expensive to be made widely available – as has been the case for novel therapeutic drug agents for cancer. ‘Defeating dementia’ might alternatively be living with dementia but more easily given appropriate help. In the same way you might be given a scooter if you have mobility problems, you might be given a computer tablet which could remind you what day of the week it is, and what jobs you needed to, to make up for your cognitive disability. For this purpose, people with dementia must know the rights that attach to them, so they become active participants in citizenship in society, not “sufferers” or victims of a disease. It’s this reframing of the narrative to the ‘medical model’ to the ‘social model of disability’ that is much warranted, and, yes, let’s DO talk about the limitations of the ‘medical model’ even if some people have invested heavily in it. I feel that is essential to consider the answer to the question, “What gives you the right to be considered alone?” When a diagnosis of dementia is closed to the person with that particular diagnosis, the actual diagnosis is being made to close friends and family too for whom the news involves a major life readjustment. The problem with charities viewing things through only a ‘dementia lens’ is that this can get in the way of ‘seeing the person not the disease’. In other words, to raise awareness of dementia, you use dementia to form the identity of that person. And as such the power attaches, say in sympathy, respect, grants, or even media status, if a label of ‘dementia’ rather than ‘MCI’ (minor cognitive impairment) attaches to you. And it is disingenuous to define someone by a condition even as important as dementia when people invariably live with other conditions. This is of course the massive problem in thinking that the ‘one drug cures all’ philosophy, in that drugs are invariably trialled on younger people with single pathologies not older people with multiple pathologies on numerous drugs. And the other travelling companions on this ‘journey’ must be the ones closest to the persons with dementia, often unpaid members of immediate family who find them thrust into a strengthened rôle of caring and/or supporting. But understanding the emotions and value of those people are vital if we are to understand various particular issues with the ‘dementia journey’, in other words the loss of an ability to make a decision on your own, the possible need to move from home to a residential care setting, or the adjustment in ‘facing up’ to dementia as a terminal illness. So I still think the answer to their question is my question. But I am particularly interested in the responses of those people currently living with dementia, and their carers, as I can more easily predict what some molecular biologists or people in charity or the pharmaceutical industry think. It can’t be said enough that they’re the real experts, so if you happen to see any as window dressing late in the afternoon of an expensive conference, do say something. In August 2015, the Mental Health Foundation published its long awaited report on dementia, rights and the social model of disability. In April 2016, the Alzheimer’s Disease International accepted unanimously a proposal from the Dementia Alliance International to prioritise rights based approaches in their policy on dementia. The “Dementia Rights” project aims to embed through word of mouth and social action a rights based consciousness towards rights. International statutory instruments and their interpretation are important in their own right, but it is critical that rights are understood by people with dementia. Without this basic awareness, it is impossible for people with dementia to use their rights locally in society. The aim of this project was to design an initiative building on the known success of ‘Dementia Friends’, launched in 2012 by the Alzheimer’s Society and Public Health England. Whilst this programme has been successful thus far in turning communication into action over basic awareness of dementia, to overcome stigma, prejudice and social isolation, the programme has its limitations. It is not intended principally for people themselves living with dementia. A programme called ‘Dementia Friends’ cannot be aimed mainly at people living with dementia. Furthermore, “Dementia Friends” does not refer to rights. The rights are pivotal, however, not only internationally but in domestic jurisdictions. The “Dementia Rights” initiative is written in such a way as to cover the main principles of rights, touching on the social model of disability, but is not dependent on any particular domestic statutory instruments, which are in a state of continual renewal. The information session is designed to take place between 45 and 60 minutes, to be given by a “Dementia Rights Champion” who is neither an expert in dementia nor in public law. It contains two interactive tasks designed to generate discussion. I hope you get a chance to explore “Dementia Rights”, to be launched officially in Dementia Awareness Week #DAW2016 by the first Dementia Rights Champions.